Some meetings at the Street Stories Festival (This weekend!) | Come Here To Me! « King Billy on the chain. This weekend sees the inaugural Street Stories Festival happening in Stoneybatter and Smithfield. There’s a wide variety of talks, walks, gigs and more taking place over the weekend, beginning tonight and carrying right through to Sunday. The majority of the events are free to attend and below we’ve listed a few we think are particularly interesting, along with the information on venues and times. Tonight sees it all begin with David Jazay, a photographer and film maker, talking about photographs he took in a Dublin before the Celtic Tiger. Jazay took many photographs of Dublin life in the late 1980s and early 1990s, showing a city that would witness huge change in the decade ahead. From shop owners to long-since redeveloped streets, the images mostly compromise Dublin’s inner-city areas. Tonight in the Cobblestone, 7.30pm. Tomorrow there are a wide variety of historical talks, covering both local history and the larger picture. At 12.30PM Liz Gillis, author of ‘The Fall of Dublin’, will be discussing the North King Street Massacre in 1916 in The Cobblestone. Brian Hanley is talking at 2.30PM on Dublin in the First World War, with that talk taking place in The Generator, Smithfield. 2.30PM also sees archaeologist Franc Myles discuss ‘Smithfield Through The Ages’ in The Cobblestone. One of the very first meetings hosted by the local history society, Myles packed the pub out before on the theme of Smithfield’s early development and history. At 4.30PM Las Fallon will be talking about ‘Dublin Fire Brigade and the Irish Revolution’, revealing that some firefighters were in the business of starting fires and not stopping them during the revolutionary period! That talk takes place in the Elbow Room, at 32 North Brunswick Street. 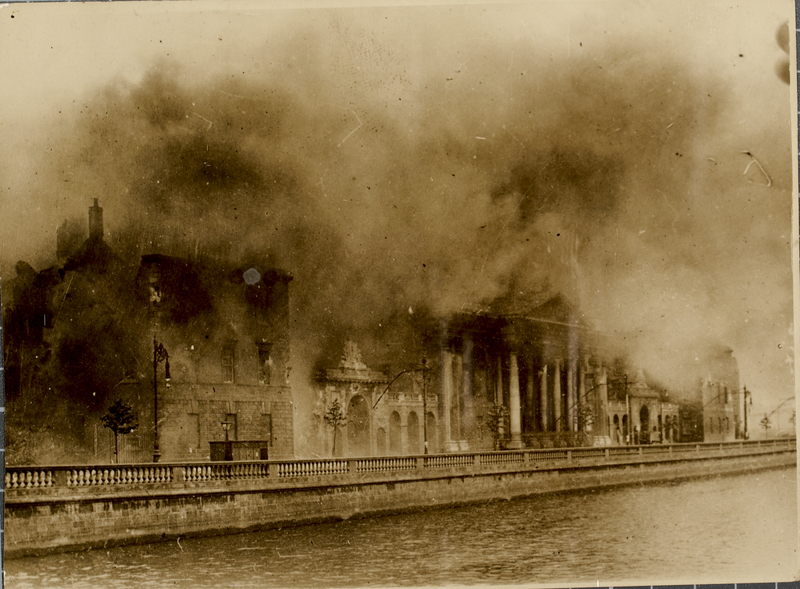 The Four Courts ablaze in 1922. On Sunday two walks have been organised to coincide with the festival. Firstly, there is a walk looking at the role of women in the Irish revolution leaving from the O’Connell Street Spire at 2pm. 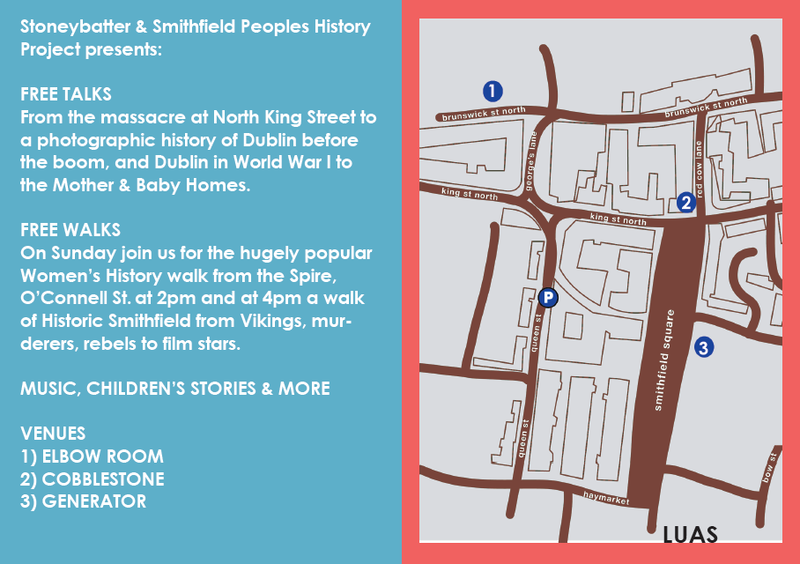 At 4pm, the ever-entertaining Alan MacSimoin will be taking people on a walking tour of historic Smithfield, covering everything from Vikings to film stars and back again. More information on the festival and the wide variety of talks taking place can be found here. To give an idea where the venues are, this map should come in handy. They are all a handy stroll from one another.